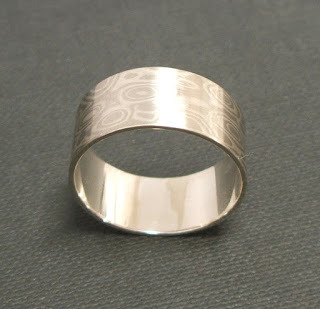 Every once in a while since Gillian Batcher has taught me how to make mokume gane I get the urge to try my hand at it. When I realized that my brother's birthday was coming up I knew I should take a chance at it again. 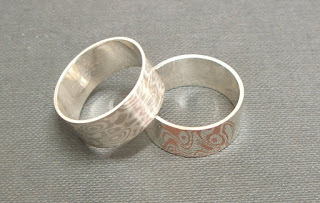 I realized that he had never seen any mokume that I had made, so that was double plus bonus as well. I went with one of my favourite metal combinations, sterling silver and nickel silver. Somehow I lucked out and made the exact amount that I needed after creating the pattern on the surface. All I had to do was solder the ends together (eek!) and then clean up the edges and voila! I then searched through some of my scrap bins and discovered a piece of sterling silver and copper mokume that I had made a while ago and decided to throw that together to make a ring. It is a huge sense of accomplishment to see an older piece and the new one to realize that I have become better at developing a great random pattern.